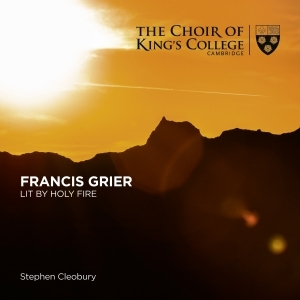 Today King’s releases a live recording of the first performance of Francis Grier’s lit by holy fire – a setting of vespers first sung in King’s College Chapel as part of the regular choral services in the Chapel. A vespers service that is, in the composer’s words, ‘less traditional than most’, lit by holy fire is set for unaccompanied choir and takes seven poems by the British writer Elizabeth Cook as its base. The scoring and musical atmosphere follows the emotional sequence of Cook’s poems, leading from darkness to light, from music often of brooding intensity and simplicity towards more complex and more animated forms and tonal pictures. The musical style overall is a nod to Rachmaninov’s soaring setting, and the full resources of the choir are utilised, from unison and homophony to complex contrapuntal configurations. Solo voices from all the different sections of the choir sing in contrast to the tutti; the dynamic range is extreme; and the tessitura in all parts covers both the lowest and highest points of those parts’ vocal ranges. The recording, taken live during the service in June 2014, includes all the readings which interspersed the music, which both composer and writer feel are integral to the setting.